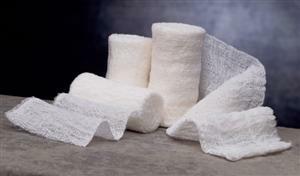 Caring Gauze Bandage Rolls: 6-Ply, 100% Cotton Unique Crimped, Open-Weave Design Means Superior Absorbency And Cushioning. Gently Stretches And Conforms To Body Contours. Used As Either A Primary Or Secondary Dressing Sterile, 4.5" X 4.1 Yds.